Holds 60 souvenir size spoons. A great way to display your spoon collections. Black matted background to create a lovely display. Brass hinges, LOCKABLE door latches, and wall brackets to hang. 60 Spoon Display Case Cabinet Rack, With glass door, wall mountable. Holds 36 souvenir size spoons. 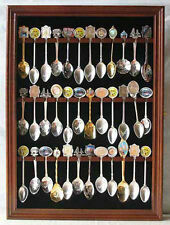 A great way to display your spoon collections. Black matted background to create a lovely display. Brass hinges, door latches, and wall brackets to hang. 1st Row: 2 1/2" H, 2nd Row: 5 1/2" H, 3rd Row: 5 1/2" H, Last Row: 5 1/2" H.
COFFEE TEA SPOON. condition very good ! Russian masters enjoyed an unrivalled command of every technique employed in gold and silverware. AK" presumably: Kolenov Afanasiy Petrov, factory location Red Village, close vicinity of Moscow at Imperial Royal Russia. "A LOS MANDARINES". COFFEE BAR GASTRONOMY. BY CHRISTOFLE. ART NOUVEAU. ANTIQUE SILVER. MATERIAL: SILVER. SCARCE PIECE! (estimated delay 3 weeks). Other spoons include ALASKA, BOSTON, GRAND OLE OPRY, HANNIBAL MO (x2), HYDE PARK NY, LAKE GENVA WI, MISSOURI, NEW YORK, SAN FRANCISCO, ST LOUIS MO, VICTORIA BC, WASHINGTON DC, WILLIAMSBURG VA, YELLOWSTONE NATL PK & U.S. BICENTENNIAL. 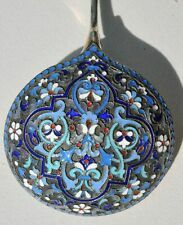 It is marked with a maker's mark in Chinese characters for an unidentified silversmith. Delightfully Oriental! - Weight: 0.95 troy oz (29.6g). 100 Thimble / Miniature Display Case (100 Slots), Glass Door, Solid Wood. A great way to display your Thimble/Miniature collections. Black matted background to create a lovely display. Brass hinges, door latches, and wall brackets to hang. Handcrafted from quality solid wood. Holds 36 souvenir size spoons. A great way to display your spoon collections. Black matted background to create a lovely display. Brass hinges, door latches, and wall brackets to hang. PART OF VERY LARGE COLLECTION THAT WE RECENTLY REQUIRED. UNCLEANED, UNTOUCHED AND AS FOUND CONDITION. Art Deco FRENCH P. MORIN Brass/Bronze-COFFEE SPOONS-6PCS. Sugar SPOON. and a peasant woman embossed inside the spoon cup. 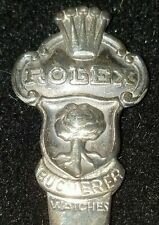 ANTIQUE, beautiful, very collectible 800 SILVER DUTCH. in order to arrange a solution. Very nicely done spoon. See photos for details. The bowl shows the hallmarks of "Augis" & "AA Lyon". Back of bowl has a leaf pattern. Very good condition. Condition: The item is in good condition for its age, and did not have any repairs. The interior is gilded, and stamped with the Russian Imperial Hallmarks, stamp corresponds to the years of production. It is in great condition, showing minor signs of age. Back is stamped Ness & Culbertson. Total weight equals 16.5 grams. Danish Sterling Silver Gilt and Enamel Spoons - Vintage 1968. BEAUTIFUL RARE ANTIQUE STERLING SILVER YAPP AND WOODWARD SPOON. FULLY MARKED. However, due to changing market conditions our prices can and do fluctuate. If you feel that a price is too high, feel free to add it to your 'watching' category and check back, it may indeed decrease. MADE IN LONDON 1780 BY THOMAS WALIS. PICTURE BACK TEA SPOON. A starter size for spoon collectors, this spoon rack would be a great to proudly display your spoon collections. The spoon rack is made of natural solid wood. Black (felt) matted background to create a lovely display. Overall very good to excellent condition. Could use light polish. Great for any collector.925 Sterling Silver. 4.25" long. The spoon is made from thick sterling and has a nice grooved edge. he lays on the rock base which is mounted to a very ornate shaft. Total standard weight of the item is ~1.0 ounces or ~0.028 Kgs. We lose the focus, and clarity in the JPG file transfer; scan is not as beautiful or focused as the actual image. Doing so is against US and International law! Overall excellent condition. Can't find another like it. Original markings. 4.25" long. Must have for any collector. 19th Century antique small silver ritual church spoon. It has oval bowl and thin hollow handle with rich decoration and acorn form at the end. There is a small hole maybe for hanging. Length 4 3/4", approx 34 grams. OSTRICH HALLMARK (SEE THE PICTURES). MONOGRAM WITH INITIALS. ANTIQUE SOAP SPOON. (estimated delay 3 weeks). Overall very good to excellent condition. Could use light polish. Great for any collector.925 Sterling Silver. 4.25" long. Makers mark "K" on backside. WHICH IS SEMI-DISPLAY AND FUNCTION READY.SOLD AS IS. EXCELLENT STRUCTURAL INTEGRITY. ADD THIS TO YOUR COLLECTION! This is beautiful and special sterling silver 925 spoon, engraved with Jerusalem's David's tower and the western wall, and also the Jewish star of David.